This is my second version of this style filter with a few improvements. It's made from 2" pvc, and 2" pvc drain/trap for the U and 90 degree piece that cost a total of $5. I cut a section of one pvc pipe to the size of Gem5 light and siliconed it in place. It also has a piece of roughed up knitting canvas for algae to grown on. On the other side, I attached another piece of pvc. This piece is optional, but by including it, it provides surface skimming and a really easy place to add and change filter floss. In the bottom of the U I placed some rubble rock for biological filtration media. I also added a piece of 3" pvc over the scrubber side that is longer than the 2". This both contains the bubbles, any escaping light and it works as a protein skimmer. I also cut and glued some pieces to the base so it would stand up on its own. I have this set up in my quarantine tank and has only been up and running for a little over a week, but so far is working well. I have a tetra 100 air pump connected to it, and I was surprised at just how much water it circulated. It may be a little large to try and hide in a tank, but for a quarantine or sump it has a lot to offer. What other filter has surface skimming, mechanical filtering, biological, and chemical filtering (nitrate and phosphate) and a protein skimmer for ~$25? Here is a better picture of the skim produced. I suppose I should get a collection setup of some kind. Here is an update of growth on this scrubber. The growth is pretty dark. I have the Gem5 on a timer for ~16 hours a day because I thought the light would be way too bright in such a small space. The only thing I can think is that the bubbles deflect/block enough light. I've increased the duration to about 20 hours a day for the next week. Use a stiff brush and clean out all the black stuff. And you can try 24 hours light. I really like this configuration of an all in one upflow scrubber. It does have one problem of accessing the inside of the pipe to clean it out. So I made a modification, starting by cutting a large slot to both house the led's and access the inside for cleaning. I then took another piece of pvc and cut it just a little more than in half so it snaps in place over the first pipe and holds tight. I then used a heat gun to soften the outer piece of pvc and shape it to the first pipe so it fits tight. I like the GEM5 lights, but I really need the led's spread out further for this application. The top and bottom is too far away from the light and doesn't grow as well. So I installed new led's. I've tried a couple different methods of trying to waterproof led's for underwater use. Fiberglass resin, and silicone don't last long term. Clear two part epoxy glue works, but it's expensive. This time I'm trying some clear casting epoxy. The same volume of this costs about 1/4 the price of the glue. I got the idea from someone used this casting resin to seal a 3d background they built. So far I'm really pleased with the results. I tried using masking tape for a makeshift mold. It didn't hold very well so I had to sand where it leaked, otherwise the inside and outside pieces won't hold tight. I should have waited a little longer, some of the sand from the sandpaper stuck in the epoxy. I'd use clay or play dough as a mold if I did it again. I used some sand mortar mix to coat the inside of the pipe as media for the algae to attach to. Now I can take off the lights, leave them in the tank/sump and carry the pipe with the algae to the sink to clean up. Mortar sticks good enough to pvc? 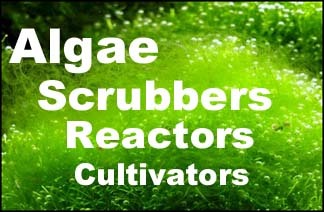 I have been pondering the feasibility of an algae reactor. Hybrid between k1 kaldness and an up flow scrubber. It sticks, I'm not sure about long term durability. I did score the inside of the pvc before I added the mortar. I've gone through a couple modifications and versions of this. Silicone and two part epoxy did not waterproof the leds and they corroded in a short period of time. Using two part casting acrylic worked well, with the exception that it doesn't stick to pvc. So the first time I used it I used a touch of super glue to hold the leds to the pvc and poured the casting acrylic over it. It lasted a while until a gap formed between between the pvc. So the latest version, I poured a small amount on the pvc and when it was setting up, pushed the leds into the acrylic before it dried make sure it didn't go all the way though. Then poured more acrylic over the leds. That has lasted the longest so far. I also dropped the mortar for an attaching media, it was just easier to remove the knitting mesh for cleaning than try to clean out the pvc. It does grown algae, but long term the algae grows really well right next to the lights and shades a large portion of the rest. So the screen never "filled in" and the total mass of the algae is not as much as my waterfall scrubber with similar surface area. To be fair, my waterfall has twice as many leds / watts. It would probably work better in a 3 or 4" pvc pipe with 10 to 20 3 watt leds. I'm going to continue to use this in my quarantine tank, but I'm going to use a waterfall type for my next tank build. In part because the waterfall style will save space "inside" my sump and because I would have to run 6 or 8 scrubbers this size for a 300 gallon system and I don't want to clean that many scrubbers. For a quarantine tank I think this setup works really well and is hands down better than not having one. It certainly does grow algae.